How Enchanted Is Disney World's Enchanted Tales With Belle? The gentle presentation is intended for young children (and children of all ages), so nothing really registers on the thrill scale save for a brief moment toward the start of the attraction when the room darkens and a “magic mirror” comes to life (and even that is quite mild). 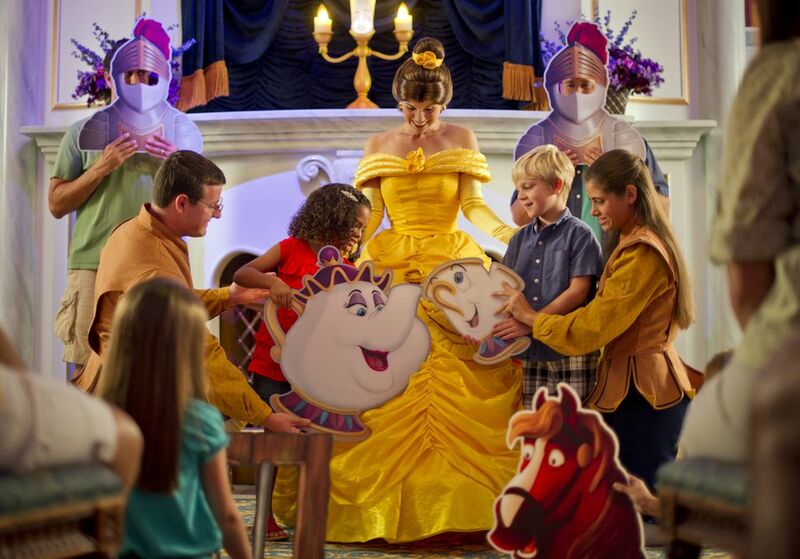 Guests can make advance reservations for Enchanted Tales with Belle using FastPass+. Would I Like Enchanted Enchanted Tales With Belle? Let's get this out of the way: Is Enchanted Enchanted Tales with Belle for you? If you have young children (especially ones who love “Beauty and the Beast”), by all means make your way to the attraction. If you have older kids—and again, especially ones who love the animated movie—your gang might still enjoy the attraction, as long as you understand that its target audience is younger children. If you are visiting the Magic Kingdom without children, you probably would want to steer clear unless you have an affinity for the film or are a huge Disney fan. By the way, if you have younger children, check out our article that lists the best Disney World rides for kids, which includes Enchanted Tales with Belle. You may be surprised to discover that two Epcot attractions make the top-10 list. Instead of a ride, Enchanted Tales is a combination walk-through experience and sit-down show. Guests make their way to the attraction by walking along a path in Fantasyland Forest to Maurice’s (the father of Belle) cottage. They enter a side door into the tinkerer's workshop, which is strewn with artifacts from his half-completed inventions. One item, a gold-framed mirror, is prominently located at the front of the room. SPOILER ALERT: If you think that learning about details of the attraction could make the experience less than enchanting for you, you may want to stop reading now. Still with us? Good. As you may suspect, the mirror plays an important role in the proceedings. Triggered by an incantation recited by the audience, it magically transforms into a door through which guests are transported to the Beast's castle. The effect is quite well done. The seemingly ordinary mirror grows, begins to glow, and displays an animated scene that ends with the castle doors opening. Magically, the mirror disappears, and guests are invited to walk through what is now an open door. A cheery "Hello-ooooo!" is bellowed by Madame Wardrobe as the audience makes its way into the second of three rooms. The towering piece of furniture welcomes guests and sets the stage for the playacting that is about to unfold. With the help of cast members, she assigns roles, such as the Beast and Mrs. Potts the teapot, to volunteer budding thespians. Each actor is given a prop and is prepped to meet Belle and “surprise” her by helping her tell the story of when she and the Beast met. With her expressive eyes and agile mouth, the animatronic character is beguiling. Belting out catchphrases (she is voiced by brassy comedian Jo Anne Worley, who also played her in the original film), Madame Wardrobe keeps the tone light. As is the case with many Imagineering achievements, young children seem to completely buy into the character, while adults are momentarily dumbfounded by the technology and artistry. While the actors gather at the front of the library, the rest of the audience sits on benches to watch the show. Lumiere calls in (a human) Belle, and the brief play commences. Coached by Belle, Lumiere, and cast members, the guests are able to perform their roles. The interactions between the animatronic characters and the audience members are fairly seamless, but given the many unknown variables that the guests bring to each show, there are bound to be some minor hiccups. Lumiere was briefly talking over some of the volunteer actors when we saw the attraction, for example, and the dialogue didn't always flow naturally. Still, it’s a bold move to develop a presentation with so many moving parts, and the fact that it works so well is a testament to its creators. We do question, however, whether some children (and adults?) who are not chosen to be part of the ensemble would be disappointed if they aren’t able to meet Belle. All of the guest actors get a small gift and have their photo taken with the soon-to-be princess, but the rest of the audience can only watch from afar. The end of the show feels a bit rushed, as Belle says that she must go to the ball and meet the “real” Beast. No doubt, the performance must be tightly controlled to cycle the guests and keep the line moving. Explaining the inspiration for Enchanted Tales, Beatty says that he and his team “wanted guests to go on a journey with animated characters. We wanted to break the plane of the screen.” By developing some of Disney’s most impressive animatronics to date and creating an attraction with a high degree of audience participation, the Imagineers have succeeded in crafting a highly immersive and emotionally engaging experience. It is one that transcends age and gender.